We are going to get right into this Place Card post with this festive Thanksgiving Place Card Idea. 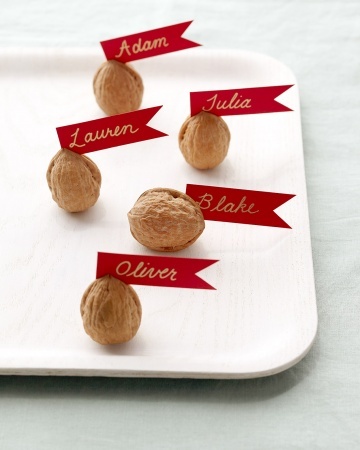 Here Martha Stewart shows us how to take an average walnut and make it into a beautiful Place Card. Make enough for your entire Thanksgiving party. I love this idea because it is a beautiful way to give your Thanksgiving table some style without spending too much money. These pumpkins are so beautiful. Made from card stock or patterned paper these pumpkins can be as stylish or simple as your would like. Passionately Artistic shows us how you could even fill the pumpkin with treats if you want to give the kids at the Thanksgiving Table an extra smile. Here is one of our Thanksgiving Place Card Crafts. Here we use some cardboard and gold paint to give the leaf an authentic look. We even use a little gold paint on the edges of the cardboard to have the place cards look very elegant. 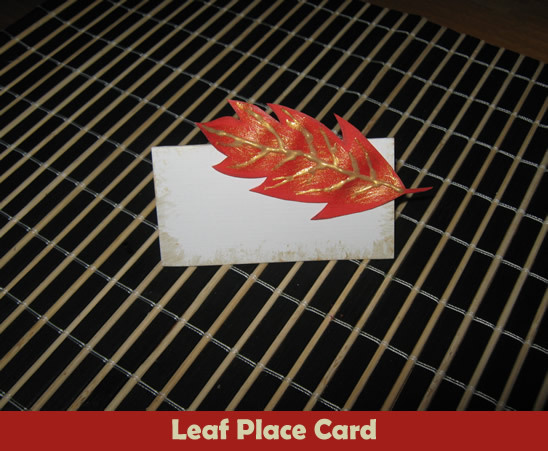 Check out How to Make Leaf Place Cards. 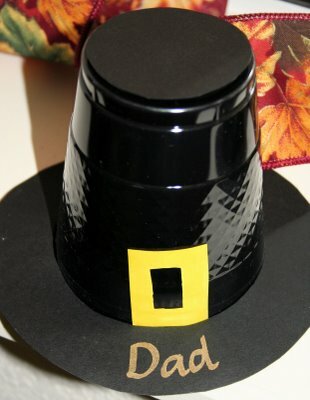 These adorable Pilgrim Hat Place Cards are actually made out of black plastic cups. 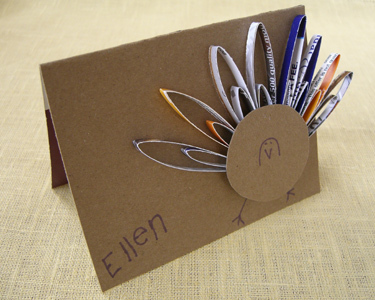 This Thanksgiving Place Card craft is super easy and the kids will love to make them. Use a little gold paint to write the names of the people attending on the lip of the hat. Check out all the craft details at Me and My Insanity. Here is a fantastically unique Place Card idea. Here Mrs. DesignHer shows us how to take some miniature flowerpots and make them into a unique Place Card. Plus, your guests will have a little treasure to take home to remember your wonderful Thanksgiving party. 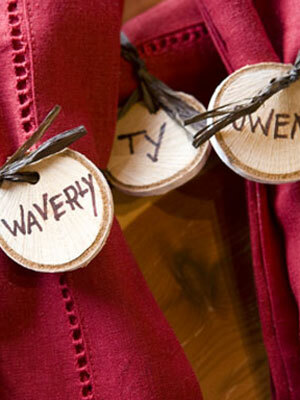 Here is a simple and perfectly festive idea for Place Cards. 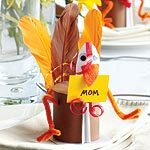 After all, these place cards have everything you need including a wonderful Thanksgiving Turkey to make both children and adults smile. I found this place card idea over at Meg Bee Designs. Here she uses Cardstock and Alphabet Stickers to make her creation. Here is another one of our Thanksgiving Place Cards crafts. Here we combine two wonderful things together into this place card. Firstly, the obvious… it’s a place card. And secondly, it’s reminds us what Thanksgiving is all about…. being thankful. On these place cards your guests will write down what they are thankful for and share their thoughts during the festivities. 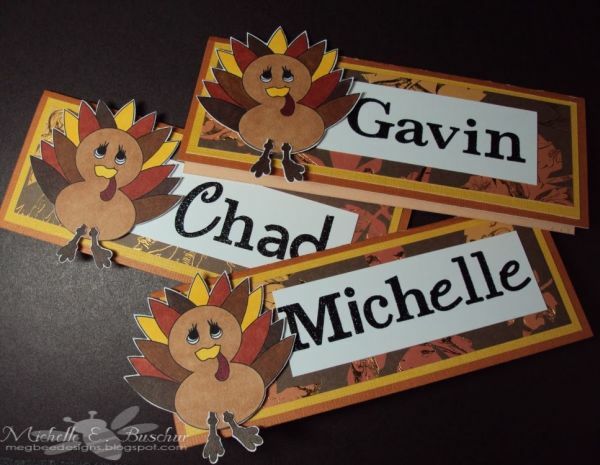 Make sure to check out how to make these Thankful Pilgrim Place Cards craft. Oh boy, do I really love these!! They are just so original and completely unique. Your guests are sure to love them. Fiskars shows us how to take discarded book pages or any type of pages you wish and make them into these awesome Place Cards. Imagine how much your guests will love these. How cool is this Turkey? So cool!! And, this turkey is a place card. 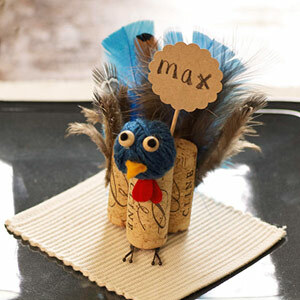 Make a whole bunch and you have yourself some Cork Turkey Place Cards. Made from actual corks…. 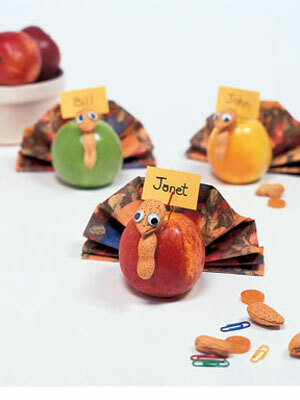 Parents came up with this splendid idea to make these cork turkeys into place cards. They are sure to be a big hit at any Thanksgiving party. I know this image is small, but I think you can get the idea that this turkey is awesome. What is even more awesome about these Turkey Place Cards is that it is made from recycled material. Got to love that! Canadian Living shows you how to take yogurt containers and transform them into these cute Place Cards. Womans Day has the right idea with this one. Here they take small apples, almonds, fruit lifesavers and some other items and turn it into this awesome looking turkey. I love the idea…. and I know your guests will too. Check out their site for the step-by-step how to. Here is another festive and quite elegant Place Card idea from Womans Day. And, if you don’t mind breaking out the electric drill for a craft… then this is the Place Card craft for you. Here they take a birch branch and cut them into disks…. write the guest’s name on your disks and your well on your way to replicating these beautiful napkin ring place cards at your house. I absolutely love these Thanksgiving Place Cards. I know exactly what it is I like about them…. it is the burlap button. I love the texture and warmth it gives these place cards. I found this place card craft over at Factory Direct Craft and I must say you need to check it out for yourself. 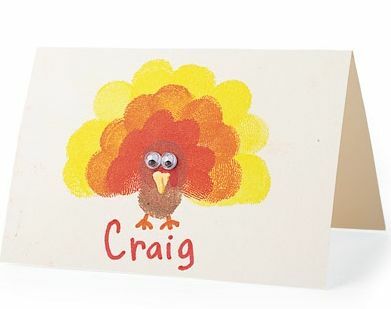 This Thanksgiving place card craft is simply adorable. And, I love that it is made from recycled paper…. that just makes it even better. I found this craft over at Alpha Mom. Here she uses junk mail for the feathers. I love how the junk mail gives the feathers a 3D look. Make sure your children help you with this place card craft…. they will love helping. 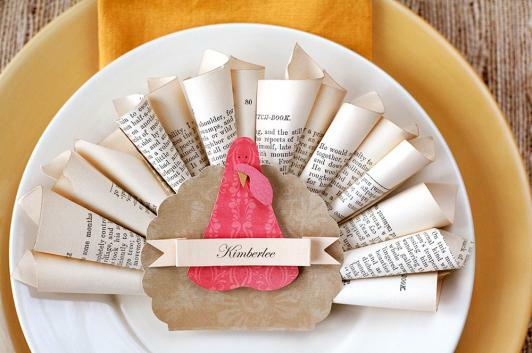 Now, these Thanksgiving Crafts are really festive and cute. Plus, they are perfect for your children and their little fingers to make. 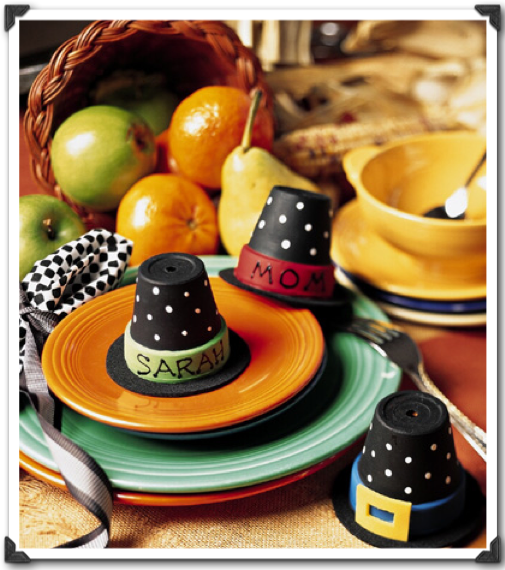 You can even make these place cards a fun activity for the kids to do before the Thanksgiving meal begins. 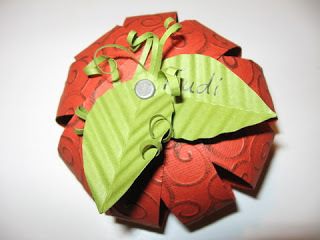 Check out Spoonful for all the fun crafty details.